Burlington College would also construct about 25 private homes, a lakeside pavilion, a building for an urban agriculture program and a pair of roads that would connect to North Avenue. The unused half of the 85,000-square-foot, 135-year-old former orphanage that dominates the property would get a major face-lift. To make it all happen, Burlington College will have to clear a series of financial, political and demographic hurdles. One stumble could threaten the whole plan. Money presents the biggest challenge for a college with a tiny endowment and the towering debt it incurred to move from a 16,000-square-foot space at the intersection of North Avenue and North Street to the 32-acre lakeside expanse. Two-thirds of the debt — $6.7 million — is in the form of a tax-exempt bond with conditions that prevent the college from contracting with for-profit developers. The school is seeking an arrangement like the one between the University of Vermont and the Redstone Commercial Group, which built 144 on-campus housing units under a long-term ground lease, according to Chief Financial Officer Bill Breen. To pull it off, Breen says, “a giant set of factors have to be woven together.” Specifically, a developer would have to pay the restricted part of the college’s debt up front before any construction could start. That price might be right for some real estate firm interested in helping the college build market-priced housing on one of the last large privately held parcels of undeveloped land in the Queen City. “I expect my inbox to start filling up soon with inquiries,” Breen said during an interview in Plunkett’s corner office. But even if Breen manages to pull off the complicated financial transaction, neighbors could tie up the building plan, which is focused at the southern end of the property. A few hundred yards closer to downtown, Mayor Miro Weinberger’s development company spent eight years fighting local opposition to the 25-unit Packard Lofts apartment project just completed at the north end of Lakeview Terrace. Weinberger expresses tentative support for Burlington College’s master plan, which he says he has reviewed in the form of “early conceptual sketches.” The proposal presents “opportunities for strengthening the college while simultaneously improving public connectivity through their site and creating additional, much-needed neighborhood housing opportunities,” the mayor said in a statement emailed to Seven Days. Later this month, Burlington College will present its expansion plans to the New North End’s joint Neighborhood Planning Assembly. Lea Terhune, a leader of the Wards 4 and 7 NPA, says she has no comment on the college’s plan because she hasn’t yet seen it. Plunkett says she aims to counter these trends by making her school a go-to option for Vermonters who haven’t traditionally continued their academic careers beyond high school. Within that sizable market segment, Plunkett adds, Burlington College will focus on the growing refugee community in the Old North End, Winooski and other nearby locales. To achieve fiscal security, Burlington College needs to tap moneyed backers. Its board of trustees is full of figures with access to potential donors, including Lake Champlain Regional Chamber of Commerce president Tom Torti, Pomerleau real-estate broker Yves Bradley, Vermont Education Secretary Armando Vilaseca and physician-psychologist Joel Miller, husband of former state senator and Jogbra entrepreneur Hinda Miller. The college has also been strengthening its ties to Jay Peak co-owner and super-developer Bill Stenger, who gave the commencement address a week ago to a graduating class of 50 students. But the college’s board has also seen the recent departure of heiress and activist Robin Lloyd. She attributes her resignation to disagreements with board chairman Adam Dantzscher, the owner of a local debt-counseling firm, concerning trustees’ decision-making processes. 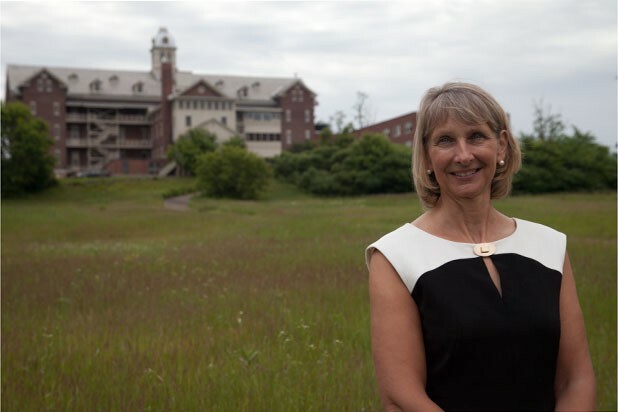 Lloyd praises Plunkett’s work as president, however, and remains on good terms with the college, where she is taking a landscape-painting course. “The teaching is good, and the students are enthusiastic,” Lloyd says. Although it appears stable at present, Burlington College has a history of staff and faculty turmoil. There has been considerable turnover among staff in the two years since Jane Sanders was eased out of the presidency in a settlement negotiated with Dantzscher. About half of the 36 current full-time employees, including faculty, are relatively recent hires. And the college isn’t on the national radar yet. Burlington College is left unranked in the much-consulted U.S. News & World Report listing of American higher-education institutions. “School did not supply enough information to U.S. News to calculate a ranking,” the publication states in its statistical entry for the school. But the school is finding a niche. A film studies program, for which the college is best known among locals, attracts aspiring moviemakers. A craftsmanship and design program, which consists mainly of instruction in woodworking at a facility in Fairfax, is operating at full capacity, Plunkett reports. The proposed “lakeside pavilion” would house — and likely boost enrollment for — its Institute for Contemplative Studies, which teaches yoga practice and “flows naturally out of Burlington College’s long-standing programs in humanistic, transpersonal and integral psychology,” Plunkett says. Forty-one years after its founding as the Vermont Institute of Community Involvement, Burlington College remains focused on civic-engagement initiatives such as public lectures, film showings and conferences. It also runs popular study trips to Cuba. A recently launched master’s degree program is showing “great promise,” Plunkett adds. In keeping with the college’s overall philosophy of “student-centered learning,” graduates pursuing a master’s are able to design their own set of studies in consultation with faculty. Former president Sanders notes that the development plan unveiled last week is similar in many respects to a blueprint drawn up during her seven-year tenure. If anything, she suggests, the proposal to house 200 students on campus may be too modest. She recalls being told by members of Burlington’s development review board that it would be preferable if the school built residential units on the North Avenue property for all of its students. Sanders otherwise declines to comment on Plunkett’s priorities. “I don’t believe that a former leader should be looking over the shoulder of the person who replaced her,” Sanders says.